Got Buzz @ Kurman Communications: ASLF's 3rd Annual Naughty or Nice Party this Friday! ASLF's 3rd Annual Naughty or Nice Party this Friday! Join the Auxiliary Board of A Silver Lining Foundation (ASLF) for its 3rd Annual Naughty or Nice Party, 7 p.m. to 11 p.m. this Friday (Dec. 3) at District Bar (170 W. Ontario, Chicago). 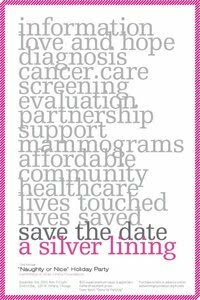 Proceeds will help support ASLF’s Buy A Mom A Mammogram program which funds no cost screening mammograms and diagnostic evaluation to uninsured and underinsured women at six partner hospitals. Tickets can be purchased online for $50 at http://www.asilverliningfoundation.org/tickets or at the door. Ticket includes four hours of premium bar, appetizers and live entertainment. For more information on A Silver Lining Foundation, please call (312) 345-1322 or visit http://www.asilverliningfoundation.org/. Subscribe to the ASLF blog at http://asilverliningfoundation.blogspot.com/.